The action was intense from the kick-off, with play swinging freely from end to end. Thistles opened the scoring early but the goal was answered quickly by Rams gun Byron Milne. 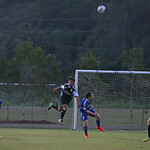 The Lismore boys fired back with a second goal and the game went into half time with a tense 2-1 scoreline. 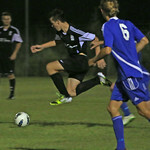 The second half saw Byron come out firing, with two quick goals giving Milne his hat-trick and young rams a 3-2 lead. George Martin made it four for the Rams as tension escalated and the play got harder. Thistles mounted a desperate fightback and own goal from Byron helped them back into the game with minutes on the clock. The Byron boys kept on the pressure, battling Lismore’s solid back line and holding out against a fast and fluid Lismore attack led by Thistles Prems’ top-scorer, Matty Armstrong. A boil over in the Thistles goalmouth saw Byron Milne red-carded and the struggle intensified for the ten-man Rams. A late goal gave Thistles the lead and, despite a valiant rally from the young Rams, the Lismore squad took the honours 5-4. The final round of the Championship is this Friday night at the Ewingsdale grounds when the Byron lads face another tough Lismore squad, Richmond Rovers.